The province of Alberta is comprised of approximately 350 municipalities and many are growing. According to the 2016 Census of Canada, Alberta leads the provinces in both rural and urban population growth, with an increase of 421,918 new residents – an 11.6% rise since the 2011 Census count. 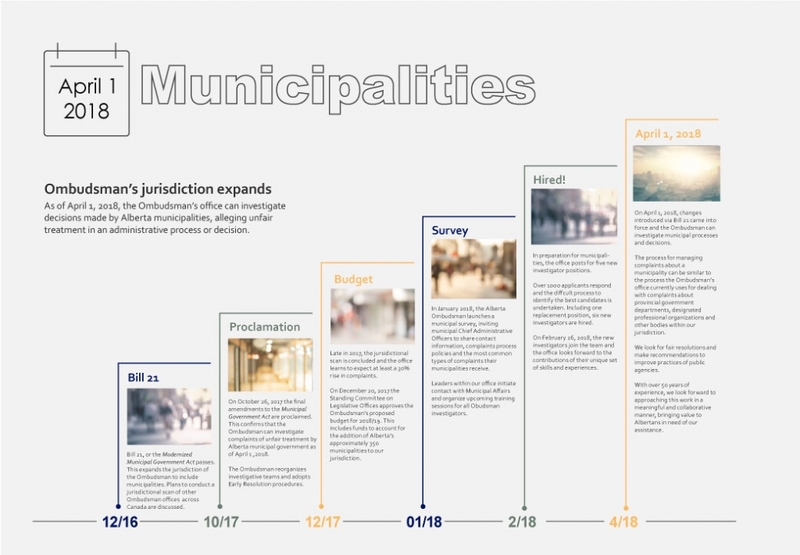 It is little wonder that in recent years, the government of Alberta has undertaken work to update the Municipal Government Act (MGA), one of the province’s largest bodies of legislation. The MGA guides how municipalities function; how they provide services that in the opinion of council, are necessary or desirable for all or a part of the municipality. Until April 1, 2018, municipalities fell outside of the Ombudsman’s jurisdiction and could not be investigated by our office. Calls from complainants with a concern about an unfair administrative decision and/or decision-making process at the municipal level would be considered non-jurisdictional, and our office would refer the complainant elsewhere. On October 26, 2017, final legislative amendments to the MGA were proclaimed, confirming the Ombudsman’s jurisdiction would expand to include municipalities as of April 1, 2018. The Alberta Ombudsman objectively investigates complaints to determine whether a municipality has acted fairly and reasonably, and whether its actions and decisions were consistent with relevant legislation, policies and procedures. For more information about the principles the Ombudsman uses in determining administrative fairness, please visit our Administrative Fairness Guidelines page. If you are a Chief Administrative Officer with questions about the Ombudsman and municipalities, check out our Frequently Asked Questions – the answer may already be here for you. You may also find our Fundamentals of a Complaints Mechanism and Internal Complaint Mechanisms Checklist to be of use.